WE ARE LIGHTING THE WAY! Henergy LED Lighting is the energy- saving lighting solutions company in Missouri. Lighting is the largest line item in any commercial building, industrial office spaces, indoor and outdoor retail venue, parking areas and roadways. Commercial electricity bills account for about 34% of the total electric energy costs. When you switch to high-efficient lighting, you see an immediate impact on your utility bill. Businesses that switch to LED lighting experience dramatically reduced energy costs as much as 75%. You also benefit from lower maintenance costs to re-lamping your facility. LEDs last 20-25% longer than traditional lighting options. LEDs also offer more illumination and better quality of light than other fixtures. WE CAN HELP LOWER YOUR UTILITY BILL! In 2018, HenergyLED and Ameren have helped many businesses like yours save money and energy. We will work with you to generate the fastest payback and best use for LED lighting replacements. Your energy cost and maintenance savings is based on a proven process called Henergy Efficiency System we manage your total lighting retrofit process – energy audit, design and analysis, installation and maintenance, utility rebates. © Copyright 2017, Henergy LED Lighting; All Rights Reserved. Website by Blue's ArtHouse Graphics & Web Design. 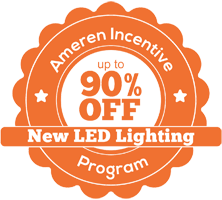 SAVE 90% ON NEW LED LIGHTING with Ameren's Incentive Program! Ameren is offering enhanced cash incentives for energy efficient upgrades for small businesses through the Small Business Direct Install Program. Henergy LED Lighting is a member of the Ameren Trade Ally Network and can help take advantage of this program.